With Moby Lines, you're not just travelling from A to B, you've already started your holiday. With pleasant surroundings and a huge range of facilities, you can enjoy both relaxation and recreation on during your journey. The ship has a large range of cabin options to choose from as well as numerous eateries and a shopping centre. This large vessel can carry up 1638 passengers and 620 vehicles on each of its trips. All those passengers can enjoy use of satellite televisions, a sun deck and solarium. There is a kennel for your four legged friends and a designated children’s world for younger voyagers. You are spoilt for choice when it comes to cabin options, with rooms to suit personal preference and pocket. There’s Inside and Outside cabin options for both Double and Quadruple berth rooms, as well as an Outside Junior Suite with porthole. The rooms come stocked with comfortable bedding and shower facilities, with extras varying depending on your booking choice. The self-service restaurant offers a variety of delicious dishes, daily specials and a children’s menu. If you don’t need a full meal or just fancy a pick me up, visit the coffee shop and snack bar. For evening entertainment head to the show lounge and piano bar. It’s the perfect setting to enjoy a night sipping on some sumptuous cocktails with friends and taking in the marvellous music. The on board shopping centre has a huge assortment of items on sale. With last minute holiday necessities, souvenirs, clothing ranges, games and more to choose from, you are bound to find what you are looking for. Satellite televisions are scattered throughout the public areas with a range of films and sporting events showing on large screens. There’s no need to miss out the beautiful weather whilst travelling. The Sun Deck allows you to kick back, take in the rays and relax on the sun loungers and seating provided on the top of the ship. You won’t have to leave your four legged friends behind as Moby Lines provide kennels for your furry companions. Young voyagers are taken care of with the ship’s Children’s world. The area comes with a large range of video games to help the journey time fly by. As well as the arcade games, there is a soft play area for the little ones to run around and burn off some energy. The ship has been specially adapted for those with restricted mobility. There is disabled access throughout the ship, public areas and bathroom facilities. 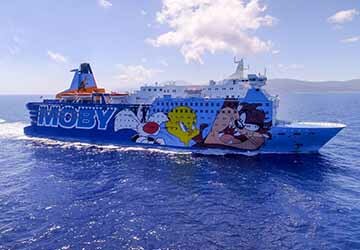 Please Note: Whilst we have taken great care in making our Moby Dada guide as accurate as possible, onboard facilities, services and entertainment may vary depending on the date and time of year that you travel, facilities mentioned may change without notification and ferry companies reserve the right to operate vessels other than those mentioned at time of booking without prior notification.